Srimad Bhagavatam - The Perfect Gift ~ The Toronto Hare Krishna Temple! This holiday season, take the perfect gift for your family & friends - a set of Srimad Bhagavatam (Bhagavat Purana), also called ‘the ripened fruit of all Vedic literature’. 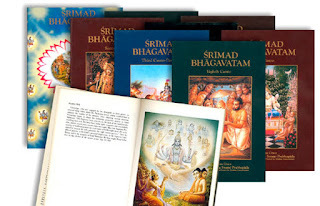 The complete Srimad Bhagavatam set contains 12 cantos in a beautiful 18 volume hardbound set, and is available also in Hindi, Tamil, Bengali, Gujarati, Telugu, and many other languages. Click here to get a glimpse into the Srimad Bhagavatam! In order to share this gift widely, it is being offered at a discounted price of $299, or only $29/month on a payment plan (offer ends Dec 31st). Please reserve your copy now before we are sold out! If you already have the Srimad Bhagavatam, we are making the entire nine volume Caitanya Caritamrita available for just $99! Please help us preserve these priceless gems of Vedic wisdom for the generations to come!